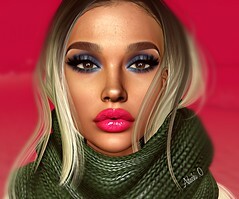 Collabor88 – Close up on me ! Pose : AMITIE – Martini – Fatpack . By Belen Ackland @Cosmopolitan 2nd July! Bodysuit : SPIRIT – Ketlin Bodysuit Glitter – Part of Ketlin Outfit. By Spirit Osmus @ Collabor88 [ February, 8 ] NEW!!! Background & Co : TAXI HERE!!! Body & co. please see on the top! Outfit : SPIRIT – Ketlin Outfit. By Spirit Osmus @ Collabor88 [ February, 8 ] NEW!! !• Save 50% on Fat Pack • Extra colors and customizable MIX&MATCH HUD ONLY IN FATPACK!! Shoes : KC COUTURE – Giselle – with Hud!!!. By Klari55a NEW!! !